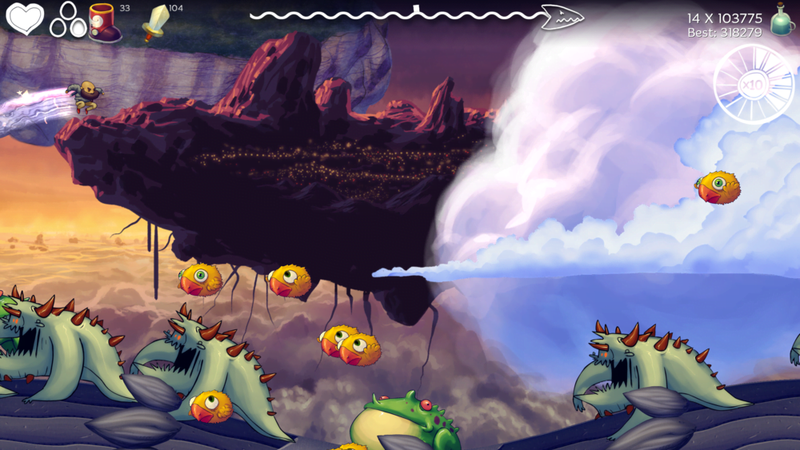 EarthNight takes place in the wake of a dragon apocalypse. Gameplay is simple in the sense that all players have to manage is mechanics for running and jumping, but they have to do it while on the back of a moving dragon. 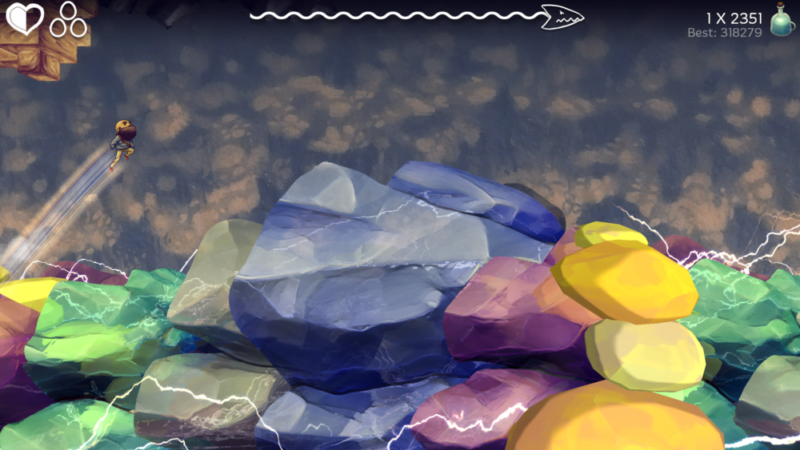 The environments are done in a beautiful hand-drawn art-style, but the levels themselves are different each time a player goes through them. The developers described this as a hybrid of procedurally generated and planned level segments. Essentially, each type of dragon has a set of programming rules that determine what pre-generated pieces can appear, but the enemies, loot, and order of appearance change with each playthrough. Coupled with EarthNight’s often frantic pace, this can lead to challenging, but rewarding gameplay. In our demo we had a choice between two characters, each possessing a unique set of abilities that alter the way they move through the environment. Where one was quick and possessed double jump capabilities, the other was a little slower, but could fall back to the ground faster, which was handy for avoiding some enemies. The character art looks great and fits very well with the game’s overall aesthetic. Each level takes place on the back of a single dragon, and when a player succeeds, they get a chance to kill it. 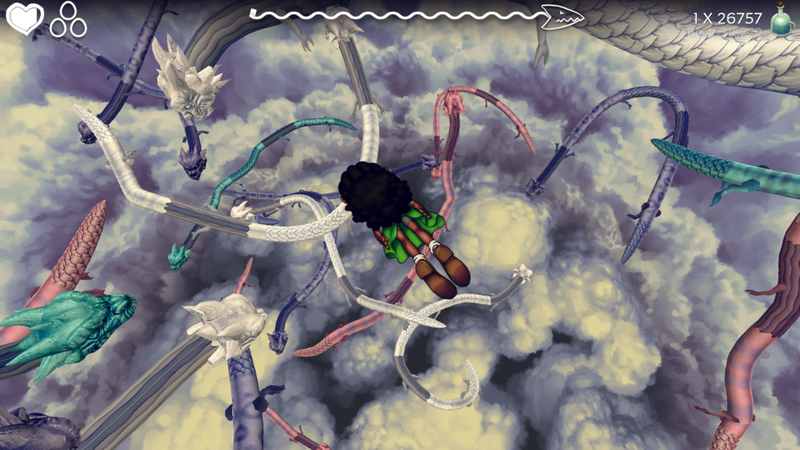 Regardless of success or failure, players are tossed back into the sky, and choose the next level by falling on the dragons below them. Eventually, when players fall to the bottom, they reach a new world, with new dragons, and new mechanics to conquer. In our brief demo, we only got to experience two dragon types, but each felt distinct, and brought a new set of challenges. Right now, EarthNight is targeting a release later this year on PS4. For more information on Earthnight, check out Cleversoft’s website, and keep an eye out for our upcoming interview with the developer’s later this month! Also keep an eye out for more PAX coverage as the show continues!